From chewy tapioca balls to fluffy coconut-lime marshmallows, here are 13 incredible sundae toppings that are sure to please. For star chef Jacques Pépin, the key to great cooking is making people happy. One way to accomplish this is with an ice cream sundae. And for that, you'll need toppings. From chewy tapioca balls to fluffy coconut-lime marshmallows, here are 13 incredible sundae toppings that are sure to please. Deeply chocolaty with a nice touch of saltiness, this addictive crumble is exquisite on ice cream. Chewy tapioca pearls cooked in lemonade are the perfect sundae topping for bubble tea lovers. You need only 20 minutes to make the ultra-rich sauce, which is excellent on these butter–pecan blondie sundaes. The delicious salty cheddar crisps that accompany this frozen-yogurt sundae are just as good with cocktails as they are with desserts. This incredible sauce was inspired by the creamy Mexican candy penuche. Try it with this amazing caramelized banana split. Crisp, buttery pound-cake croutons are the best part of this adult sundae. Almond extract and almond milk give this luscious chocolate sauce its fantastic flavor. Shards of peanut brittle made with a generous pinch of cinnamon add terrific flavor and crunch. You can’t go wrong with this ever-versatile sticky sauce. Rice Krispies cereal, banana chips and roasted peanuts form the perfect crunchy topping. This healthy topping requires just four ingredients: blueberries, sugar, fresh lemon juice and a pinch of salt. Nancy Silverton’s incredible sauce is made with brewed coffee, rum and bittersweet chocolate. 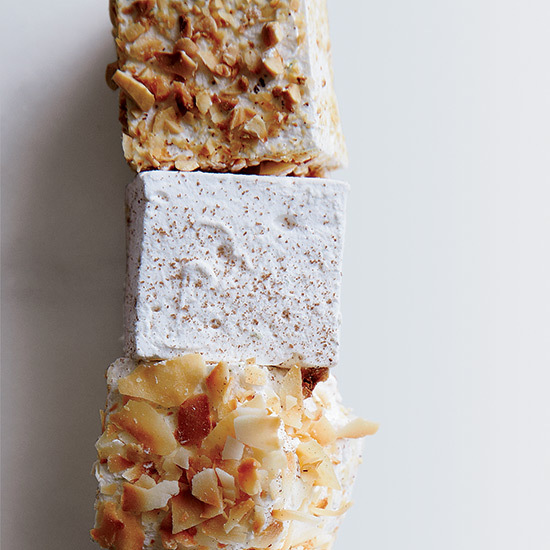 Pastry genius Dominique Ansel’s airy marshmallows are fantastic on their own or flavored with cinnamon, coconut-lime or hazelnut.